The administration's Making Home Affordable Program (HAMP) is beginning to look a little more robust based on figures released Wednesday the U.S. Treasury Department and the Department of Housing and Urban Development (HUD), joint sponsors of the program. The newest figures indicate more borrowers are emerging from trial loan modifications and signing permanent loan modification offers. 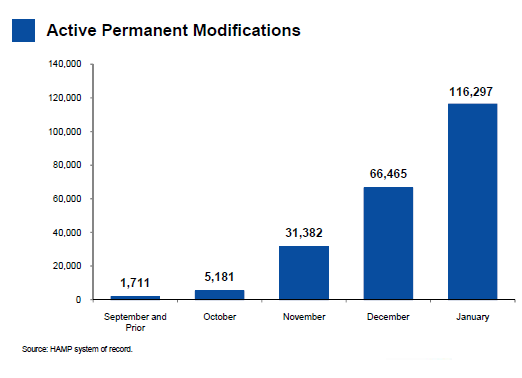 As of the end of January, a total of 116,297 permanent loan modifications had been signed, nearly double the 66,465 reported at the end of December. An additional 76,482 had been extended permanent modification offers but had not yet returned the paperwork. 830,438 borrowers are still in some stage of the required three month trial period required by the program guidelines. Since the program began last spring, 1,269,937 households have been extended loan modifications offers, 1,008,216 of which had enrolled in trials. 60,500 had been cancelled. However, the rate at which new candidates are entering the program is dropping. The increase in enrollment from December to January was 80,500 compared to 109,500 from November to December and 110,081 the month before that. Enrollment in the trial peaked in October at 157,000. The Treasury Department estimates that there are approximately 5.6 million first mortgage loans that are 60 or more days delinquent, however, only 1.7 million of these are currently estimated to be eligible for inclusion in the HAMP program. Eligible loans are modified so that payments do not exceed 31 percent of monthly income through interest rate reductions and, where necessary, an extension of the term of the loan or forbearance of principal. The Treasury Department estimates that the median decrease in monthly payment is $522. Some fall out of eligibility because they are FHA or VA loans, jumbo loans, or those originated after the eligibility end date for origination. Others are eliminated based on being non-owner occupied or vacant or for having negative income or a borrower debt ration already below the 31 percent level the program is designed to achieve. 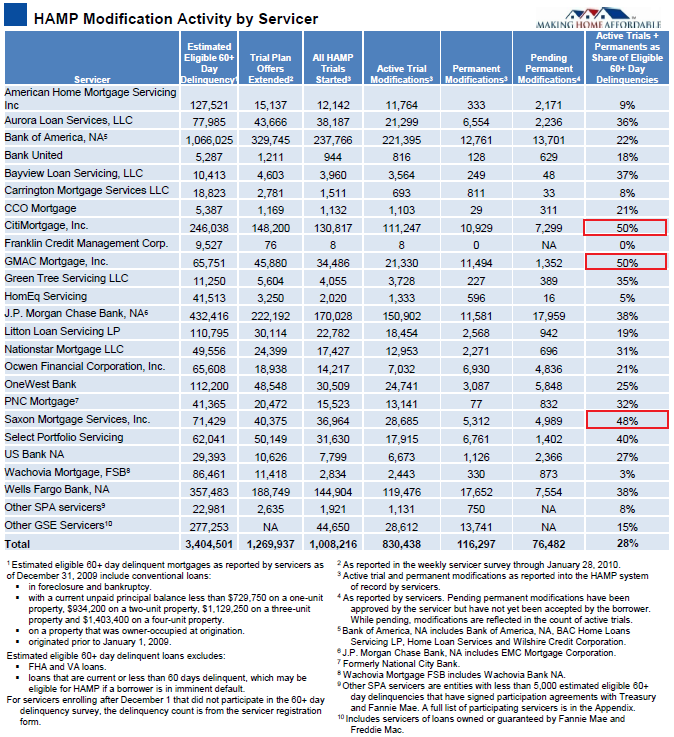 While the report states that these numbers represent a one-time snapshot and that more borrowers are expected to become eligible for HAMP, it still appears that there are a significant number of troubled loans out there that may not be reached by programs such as this and may proceed to foreclosure. HAMP utilizes loan servicers to contact borrowers who are 60 days or more delinquent on their mortgage payments, evaluate their eligibility for the program and do the paperwork necessary to enroll them in trial modifications. Over 100 servicers are now enrolled as participants in the program and firms servicing Freddie Mac and Fannie Mae owned loans are automatically enrolled as HAMP participants. 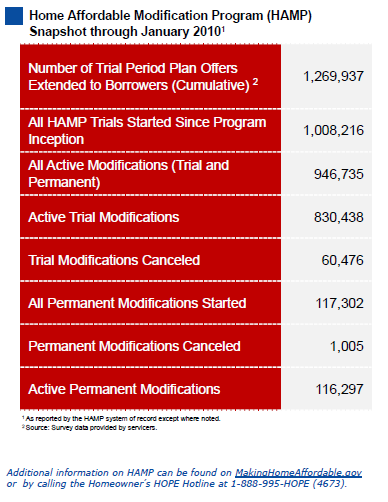 The HAMP program has been criticized for the low rate of conversion from trial to permanent modification status and, in January program administrated enacted a program of increased supervision of servicers and additional assistance to borrowers in an attempt to improve the conversion rate. Three of the servicers, CitiMortgage, GMAC, and Saxon Mortgage Services are at or near having enrolled 50 percent of their delinquent loans in the program and most of the large servicers have enrolled 30 to 40 percent of eligible loans in modifications. While borrowers must keep their modified loans current for three months before converting to permanent status, only about 7,000 permanently modified loans have aged more than three months so the program is still too young to allow any estimates of the rate of default. As reported here yesterday, it is estimated the redefault rate on Freddie Mac and Fannie Mae loan modifications are running at about 60%. 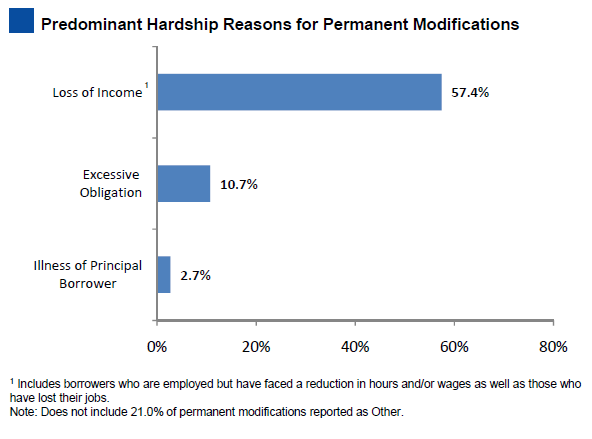 It is noted that the majority of successful loan modifications, 57.4% to be exact, have been borrowers who are out of work or are underemployed. If those borrowers are unable to get work, those loans might end up defaulting anyway. Again, this calls attention to the need for stimulus in the labor market.